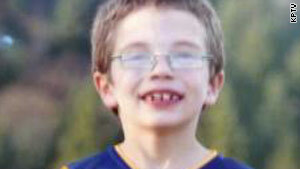 Oregon second-grader Kyron Horman has not been seen since Friday. (CNN) -- Police questioned nearly all of the children at an Oregon school where a missing 7-year-old child boy was last seen, authorities said Monday evening. Captain Jason Gates of the Multnomah County Sheriff's Office said about 90 percent of the students at Skyline Elementary School were interviewed in connection with last Friday's disappearance of Kyron Horman. In a statement released to the media, the sheriff's office said investigators were "appealing to the families who have not been interviewed to call the tip line and leave their information." According to investigators, the boy's stepmother said she last the saw second-grader Friday morning while he was walking down the hallway towards his classroom. "There was a science fair here at the school," Portland Schools spokesman Matt Shelby told CNN. "You had a situation with lots of parents and friends coming through the school, going class to class." The science fair was held before the beginning of classes, Shelby added, "so working parents could come and participate" he said. In the statement released Monday evening, authorities said search and rescue personnel have been canvassing new areas based on tips and information gathered by the sheriff's office. "Tips have been coming in from all over the state and into Washington. All of those tips are being followed up and investigators are urging people to call the tip line with any information at all," the statement read. The Multhnomah County sheriff's office reported that no one at the school saw Kyron after 8:45 a.m. Friday and that Kyron never made it to his classroom. Authorities have also utilized Portland Police bureau's air unit in an attempt to locate the missing child. "My heart, and the hearts of everyone who is a part of Portland Public Schools, goes out to Kyron Horman and his family," said Portland Schools Superintendent Carole Smith in a statement. Counselors have been made available to children and teachers at Kyron's school, Shelby said. "Our focus is on supporting the students and staff," he said.